A comic strip created by Lynn Johnston, see JOHNSTON Lynn, and syndicated by Universal Press, It began September 10, 1979. Three books can be considered precursors to this popular cartoon strip. They are David We’re Pregnant! !, Hi Mom1 Hi Dad! and Do They Ever Grow Up? See JOHNSTON Lynn. Front: A Look Inside For Better or For Worse: The 10th Anniversary Collection. Car., & Writ., Lynn Johnston.Andrews & McMeel Inc., 1989. Front: It’s The Thought That Counts: Fifteenth Anniversary Collection.. Car., Lynn Johnston. Andrews & McMeel Inc., 1994. Front & Back: The Lives Behind The Lines: 20 Years of For Better or For Worse. . Car., Lynn Johnston. Andrews & McMeel Inc., 1999. Front: Suddenly Silver: Celebrating 25 Years of For Better or For Worse. Car., Lynn Johnston. Andrews McMeel Inc., 2004. Front: Just One More Hug. Car., Lynn Johnston. Andrews & McMeel Inc., 1984. Front: Keep The Home Fries Burning. Car., Lynn Johnston. Andrews & McMeel Inc., 1986. Front: Starting From Scratch. Car., Lynn Johnston. Andrews & McMeel Inc., 1995. Front & Back: The Big 5-0. Car., Lynn Johnston. Andrews & McMeel Inc., 2000. Front & Back: Growing Like a Weed. Car., Lynn Johnston. Andrews & McMeel Inc., 1997. Front & Back: Love Just Screws Up Everything. Car., Lynn Johnston. Andrews & McMeel Inc., 1996. Front & Back: Middle Age Spread. Car., Lynn Johnston. Andrews & McMeel Inc., 1998. Front & Back: Reality Check. Car., Lynn Johnston. Andrews & McMeel Inc., 2003. Front & Back: Sunshine & Shadow. Car., Lynn Johnston. Andrews & McMeel Inc., 1999. Front & Back: With this Ring. Car., Lynn Johnston. Andrews & McMeel Inc., 2003. Front & Back: More Than a Month of Sundays. Car., Lynn Johnston. Andrews & McMeel Inc., 1983. Front & Back: Our Sunday Best. . Car., Lynn Johnston. Andrews & McMeel Inc., 1984. Wraparound: Graduation: A Time For Change. Car., Lynn Johnston. Andrews & McMeel Inc., 2001. Wraparound: If This Is a Lecture, How Long Will It Be? Car., L. Johnston. Andrews & McMeel Inc., 90. Wraparound: I’ve Got the One-More-Washload Blues. Car., L. Johnston. Andrews & McMeel Inc., ‘81. Wraparound: Is This “One Of Those Days”Daddy? Car., L. Johnston. Andrews & McMeel Inc., 1982. Wraparound: It’s All Downhill From Here. Car., Lynn Johnston. Andrews & McMeel Inc., 1987. Wraparound: “It Must Be Nice to Be Little”. Car., Lynn Johnston. Andrews & McMeel Inc., 1983. Wraparound: Pushing 40. Car., Lynn Johnston. Andrews & McMeel Inc., 1988. Wraparound: There Goes My Baby. Car., Lynn Johnston. Andrews & McMeel Inc., 1993. Wraparound: Things Are Looking Up. Car., Lynn Johnston. Andrews & McMeel Inc., 1992. Wraparound: What Me Pregnant? Car., Lynn Johnston. Andrews & McMeel Inc., 1991. Front: Remembering Farley. Car., Lynn Johnston. Andrews & McMeel Inc., 1996. For Better Or For Worse: The Comic Art Of Lynn Johnston. Ed., Paula Sarson. Car., Lynn Johnston. Writ., Lynn Johnston, Katherine Hadway & Amber Landgraff. Goose Lane Editions/Art Gallery of Sudbury. 2015. Anniversary “For Better Or For Worse”: A Look Inside For Better or For Worse: The 10th Anniversary Collection. Car., & Writ., Lynn Johnston.Andrews & McMeel Inc., 1989. It’s The Thought That Counts: Fifteenth Anniversary Collection. Car., Lynn Johnston. Andrews & McMeel Inc.,1994. The Lives Behind The Lines: 20 Years of For Better or For Worse. . Car., Lynn Johnston. Andrews & McMeel Inc., 1999. Suddenly Silver: Celebrating 25 Years of For Better or For Worse. Car., Lynn Johnston. Andrews & McMeel Inc., 2004. The Big 5-0. Car., Lynn Johnston. Andrews & McMeel Inc., 2000. Family Business. Car., Lynn Johnston. Andrews & McMeel Inc., 2002. Graduation: A Time For Change. Car., Lynn Johnston. Andrews & McMeel Inc., 2001. Growing Like a Weed. Car., Lynn Johnston. Andrews & McMeel Inc., 1997. I’ve Got the One-More-Washload Blues …. Car., Lynn Johnston. Andrews & McMeel Inc., 1981. If This Is a Lecture, How Long Will It Be? Car., Lynn Johnston. Andrews & McMeel Inc., 1990. Is This “One Of Those Days”Daddy? Car., Lynn Johnston. Andrews & McMeel Inc., 1982. “It Must Be Nice to Be Little”. Car., Lynn Johnston. Andrews & McMeel Inc., 1983. Just One More Hug. Car., Lynn Johnston. Andrews & McMeel Inc., 1984. Keep The Home Fries Car., Lynn Johnston. Burning. Andrews & McMeel Inc., 1986. Love Just Screws Up Everything. Car., Lynn Johnston. Andrews & McMeel Inc., 1996. Middle Age Spread. Car., Lynn Johnston. Andrews & McMeel Inc., 1998. Pushing 40. Car., Lynn Johnston. Andrews & McMeel Inc., 1988. Reality Check. Car., Lynn Johnston. Andrews & McMeel Inc., 2003. Starting From Scratch. Car., Lynn Johnston. Andrews & McMeel Inc., 1995. Sunshine & Shadow. Car., Lynn Johnston. Andrews & McMeel Inc., 1999. There Goes My Baby. Car., Lynn Johnston. Andrews & McMeel Inc., 1993. Things Are Looking Up. Car., Lynn Johnston. Andrews & McMeel Inc., 1992. What Me Pregnant? Car., Lynn Johnston. Andrews & McMeel Inc., 1991. With this Ring. Car., Lynn Johnston. Andrews & McMeel Inc., 2003. More Than a Month of Sundays. Car., Lynn Johnston. Andrews & McMeel Inc., 1983. 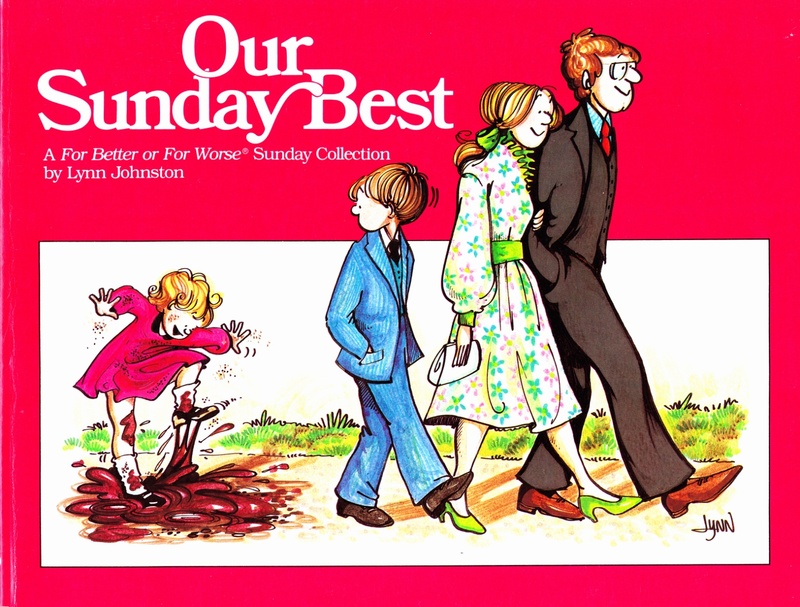 Our Sunday Best. . Car., Lynn Johnston. Andrews & McMeel Inc., 1984. Remembering Farley. Car., Lynn Johnston. Andrews & McMeel Inc., 1996. 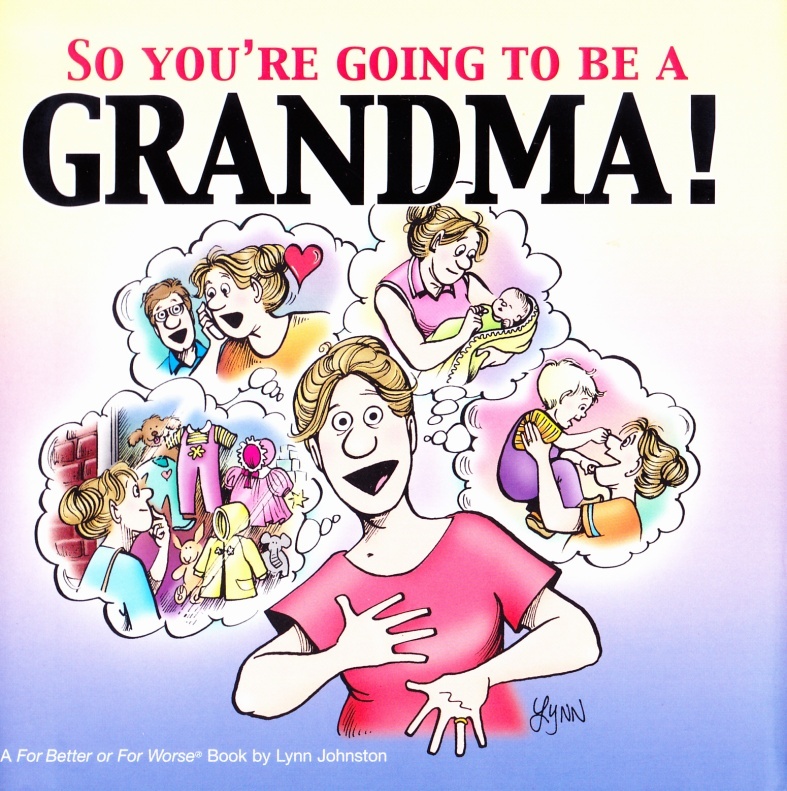 Front & Back: So You’re Going To Be A Grandma! Car., L. Johnston. Andrews & McMeel Inc., 2005. So You’re Going To Be A Grandma! Car., L. Johnston. Writ., A. Parton. Andrews & McMeel Inc., 2005. For Better or For Worse: The Family Album. Celebrity Home Entertainment Inc., 1994. CHE 3215. Part of the Just For Kids Home Video Series. Recorded from a 1992 animated feature based on Lynn Johnston’s cartoon characters, produced for television by Lacewood Productions Inc. and CTV Television Network. “A Look Inside For Better or For Worse.” Writ., Lynn Johnston A Look Inside For Better or For Worse: The 10th Anniversary Collection..Andrews & McMeel Inc., 1989. “Lives Behind The Lines.” The Lives Behind The Lines: 20 Years of For Better or For Worse. . Writ., Lynn Johnston. Andrews & McMeel Inc., 1999. “A Note From Lynn’s Husband Rodnston.”: 44. “The Middle Years. Writ., Lynn Johnston: 87-91. “Growing Up With Ma – a Note from Lynn & Rod’s Daughter Kate Johnston.”: 119. “A Note From Lynn’s Brother-in-law, Ralph Johnston.”: 165. “A Note From Lynn’s Sister-in-law, Beth Cruikshank.”: 180. “The Later Years.” Writ., Lynn Johnston: 188-191. “A Window into Two Worlds – a Note from Lynn & Rod’s Son, Aaron Johnston: 246. So You’re Going To Be A Grandma. 2005: Front cover. Our Sunday Best. 1984: Front cover.